The presence of dark matter (DM) in the universe is widely supported by a wealth of astronomical observations. One of the key observables is the Cosmic Microwave Background (CMB), produced about 380.000 years after the Big Bang when the universe became transparent to radiation. The latest measurements on the CMB with the Planck satellite show that today about 85% of the total matter in the Universe is so-called cold dark matter, most likely made of yet unknown elementary particles. Well motivated theories beyond today's Standard Model of particle physics can accommodate for such particles, referred to as Weakly Interacting Massive Particles (WIMPs) because of their relatively large mass (in the range of a few GeV to a few hundred TeV) and their weak interaction with standard model particles. Among those theories are Supersymmetry and Universal Extra Dimension models. Fig 1: Gamma-ray map of the inner 300 parsecs of the Galaxy as seen by H.E.S.S. phase I. The regions of interest (ROIs) used to look for DM line signals are shown in the centre as shaded annuli of 0.1° width. 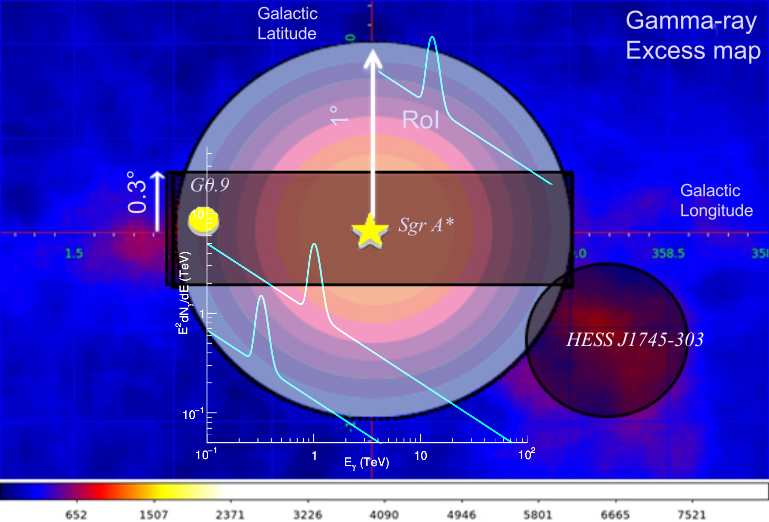 Regions of the sky containing the astrophysical gamma-ray sources HESS J1745-290, G0.9+01, HESS J1745-303, and the diffuse emission, are shown by the light-gray filled box and disc; these regions are not used in the search. Overlaid are examples of possible gamma-ray line signals represented by a Gaussian function centred at an energy equal to the DM mass, with a width of 10%. The lack of hints for such WIMPs in experimental searches at colliders (i.e. LHC) and in direct and indirect detection experiments means that chances are high that WIMPs are TeV-mass rather than at GeV-mass particles: TeV-mass particles pose a challenge to collider experiments (because colliders cannot easily provide the energy needed to produce TeV WIMPs), as well as to direct detection experiments (because the number density of WIMP particles is reduced as their mass is increased). Therefore, indirect detection experiments are vital to probe the existence of TeV-mass dark matter. In particular, the search for line-like signatures from the annihilation of dark matter into gamma rays is well motivated, because such signals are easily distinguishable from standard astrophysical emission. However, such line signals are typically suppressed by a factor of 10-1 to 10-4 with respect to the expected continuum emission. It is therefore important to search for such a signal in particularly dark matter-dense regions of the sky, i.e. in regions where a lot of these annihilations are supposed to happen. Due to its proximity and high density of DM, the largest observable gamma-ray flux of DM annihilations is expected to come from the Galactic Centre (GC) region (in this analysis, the DM density distribution in the GC region is assumed to have a cuspy shape, for which standard parametrisations are described by the Einasto  or NFW  profiles). However, searches towards the GC are hampered by the presence of numerous astrophysical sources and diffuse emission from cosmic-ray interaction in the interstellar medium. The GC region has been regularly observed by H.E.S.S. since 2004. Observations carried out with the H.E.S.S. phase I for 10 years amount to a total of 254 hours of live time at the nominal position of the central supermassive black hole Sagittarius A*. We search for a DM signal in a circular region of interest (ROI) of 1° centered on the GC position. In order to handle the standard astrophysical emissions and avoid background contamination from the gamma-ray sources HESS J1745-290 coincident in position with Sagittarius A* , the supernova/pulsar wind nebula G0.9+0.1 , and the diffuse emission extending along the Galactic plane [5,6], we masked these regions in the data analysis. Such an approach is robust as it does not require any modelling of the standard astrophysical emissions. The whole ROI is further divided into smaller circular regions as shown in Fig. 1. In this way, the sensitivity to the DM signal is improved, because the expected cuspy spatial distribution of the DM signal towards the centre can be taken into account in the analysis procedure. Fig 2: Example of the background estimation technique for the ROI 2 for a specific observational run. Two different telescope pointing positions are shown by the black crosses. To estimate the background in the signal region (yellow segments), background control regions (blue segments) are defined by rotating the signal region around the pointing position. 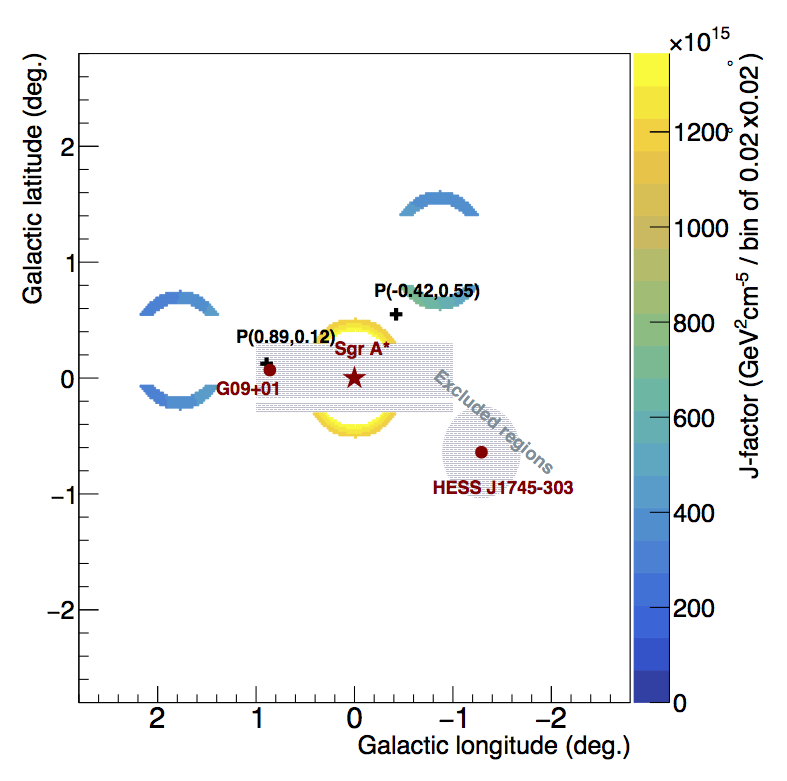 The red star and red dots mark the positions of Sgr A*, G0.9+0.1 (red dot), and HESS J1745-303, respectively. The grey-filled box covering Galactic latitudes from -0.3° to +0.3° and the grey-filled disc are excluded for signal and background measurements. The color scale shows the J-factor value per spatial bin of 0.02°x0.02° for the Einasto DM profile. In order to allow for the most precise determination of residual cosmic-ray background in the dataset, it is estimated from the field of view of the observations themselves. The DM signal is searched for in an signal region, i.e. in one of the ROIs, whereas the background within this ROI is determined from a background control region constructed towards the other side of the telescope pointing position. Such background estimation is carried out for each observation separately, and guarantees stable background determination under the same observational and instrumental conditions as for the signal. Fig. 2 shows an example of this technique, together with the expected DM signal strength (expressed in terms of the so-called J-factor) in both the signal and background control regions. Note that the expected DM signal in a background control region is much smaller than that in the signal region, depending on the assumed distribution of DM density. Fig 3: Constraints on the velocity-weighted annihilation cross section for the prompt annihilation into two photons computed from H.E.S.S. I observations of the inner 300 pc of the GC region. 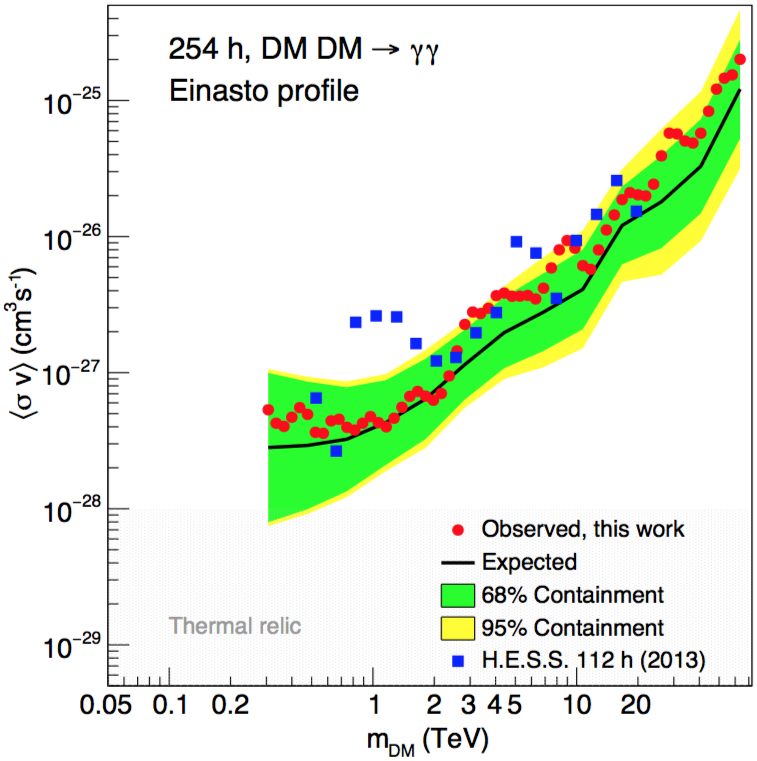 The constraints are expressed in terms of 95% CL upper limits as a function of the DM mass, assuming an Einasto density profile. The observed limits are shown as red dots. The mean expected limits (solid black line) together with the 68% (green band) and 95% (yellow band) CL containment bands are shown as well. The observed limits derived in the analysis of four years (112 h of live time) of GC observations by H.E.S.S. are shown as blue squares, together with their mean expected limit. The natural scale for a monochromatic gamma-ray line signal is highlighted as a grey-shaded area. Using a maximum likelihood analysis exploiting both the spatial and spectral characteristics of the DM signal with respect to the background , no statistically significant gamma-ray excess is found in any of the seven ROIs. In the analysis, the DM line signal is modelled as a Gaussian function centred at the line energy E = mDM with a width of 10% according to the energy resolution of H.E.S.S. The constraints on the velocity-weighted annihilation cross section <σ v> on monochromatic DM lines are derived at 95% confidence level (CL). Figure 3 shows the constraints on <σ v> calculated from the full H.E.S.S. I dataset compared to those from an earlier H.E.S.S. analysis obtained with about half the lifetime of the current dataset . The new constraints obtained by H.E.S.S. are the strongest so far in the TeV DM mass range assuming a cuspy distribution of the DM in the Milky Way, improving over the previous H.E.S.S. limits by a factor of about 6 at 1 TeV. As mentioned above, the indirect search with gamma-rays is a crucial tool to probe the nature of dark matter in the universe, which is complementary to other techniques devised to look for signatures of dark matter. Direct searches and production at colliders are powerful techniques to probe DM up to masses of hundred GeV. The sensitivity of the LAT instrument on-board the Fermi satellite extends up to a few hundred GeV, while ground-based telescopes are the only tools available to probe the TeV mass range. Among these ground-based experiments, H.E.S.S. has currently the largest sensitivity towards the GC region and yields the most constraining limits on the annihilation cross section so far. H.E.S.S. results in the prompt-photon channel cannot yet probe the natural scale (as indicated by the grey-shaded area in Fig. 3) for DM annihilation, but they strongly constrain WIMP models with larger cross sections due to the presence of enhanced gamma-ray lines (e.g. from the Sommerfeld effect) . H. Abdallah et al. (H.E.S.S. Collaboration), "Search for gamma-ray line signals from dark matter annihilations in the inner Galactic halo from ten years of observations with H.E.S.S. ", currently under submission. V. Springel, S. D. M. White, C. S. Frenk, et al., Nature 456, 73 (2008), 0809.0894. J. F. Navarro, C. S. Frenk, and S. D. M. White, Astrophys. J. 490, 493 (1997), astro-ph/9611107. F. Aharonian et al. (H.E.S.S. Collaboration), Astron. Astrophys. 425, L13 (2004), astro-ph/0408145. F. Aharonian et al. (H.E.S.S. Collaboration), Astron. Astrophys. 432, L25 (2005), astro-ph/0501265. F. Aharonian et al. (H.E.S.S. Collaboration), Nature 439, 695 (2006), astro-ph/0603021. A. Abramowski et al. (H.E.S.S. Collaboration), Nature 531, 476 (2016), 1603.07730. H. Abdallah et al. (H.E.S.S. Collaboration), Phys. Rev. Lett. 117, 111301 (2016), 1607.08142. A. Abramowski et al. (H.E.S.S. Collaboration), Phys. Rev. Lett. 110, 041301 (2013), 1301.1173. J. Hisano, S. Matsumoto, and M. M. Nojiri, Phys. Rev. Lett. 92, 031303 (2004), hep-ph/0307216.